Organising children’s parties can be stressful and take up a lot of time. I have created a Cheat Sheet to help you know what to do and when. Here are a few reasons why you’ll love what we do! Absolutely everything, including a party coordinator to stay and help for the duration of the party. All of our children’s parties come with a party coordinator, PDF invitations, crafts, party favours, hire of kids chairs, tables and gazebo, amazing party props to really set the theme, partyware and hire of our fab dress-up rack. We have researched and trialled many entertainment companies and have partnered with the best. We will manage the booking and confirmation process of all entertainers. There’s no need to spend countless hours researching that perfect entertainer – we will be your only contact throughout the party planning process. When you book a party with us we make it our highest priority. You will receive an email confirming all the information for your chosen party date and time along with an invoice. When the deposit is received you will receive personalised invitations and we will start locking in all aspects of your party, from entertainers to cake decorators to delivery drivers. making sure your party runs as smoothly as possible. Yep, we really do it all! We offer kids catering boxes which include 5 items from our menu and a juice popper and we have teamed up with an amazing cake decorator to make the most gorgeous, yummy and personalised birthday cakes for your chosen theme. We have packages that include hosting, catering and entertainment so you literally have nothing to do except have fun with your little ones and friends. Two weeks before the party date we’ll confirm all of the details of your party, including our arrival time, your party coordinator’s name and a proposed agenda to make sure your child’s party is a complete success. We’re super social – come and join us on Instagram. We have created many memories in Sydney, Melbourne, Geelong and Townsville. See what a few people have to say about us – and find more on our Reviews Page. All in All Parties are AMAZING! 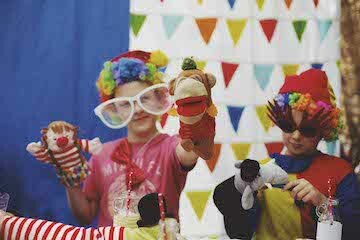 I recently used them for my son’s birthday and was blown away by the set-up and the professionalism of this service. On the day, Lisa bent over backwards to ensure a good time was had by all the children, but also by mum! I could not recommend this service more highly. It’s worth every dollar and for what you get it’s a great price point. Thanks All in All Parties, I will certainly be recommending you to all my friends. Angela, I just wanted to write to you and say the biggest, warmest, most amazing THANK YOU!!! Portia’s party was such a huge success thanks to you! And we are just all on cloud nine after such an amazing event! YOU ARE AMAZING!!! We will be contacting you every year! And I have passed on your details to about five mums already! Thank you thank you thank you!!!! Lisa, it was fantastic!! Every parent at our party was so impressed and every single parent went home with your business card. They all just LOVED it and it was so easy for me too. Thank you for everything and for looking after every little detail. Your staff member was amazing too! We will now use you for all of our further parties! Thank you, thank you, thank you. Thanks so much Angela for your gorgeous set up! I loved every part of it and that extra help is exactly what I needed. I’ll definitely be using you in the future for the next children’s parties. You outdid yourself. You exceeded my expectations and brought out exactly what I was envisioning. Thanks once again. Let the fun begin! Leave the stress to us, sit back, relax and enjoy while creating memories that last a lifetime.